We Accept Fresh Cooked Orders! 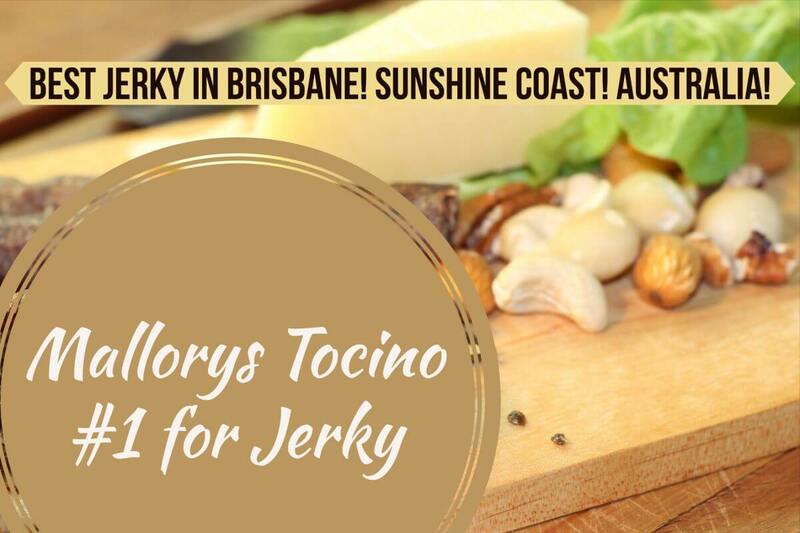 Shop Online or find us at the Eumundi Markets, Caboolture Markets, local Brisbane markets and selected food festivals for the best Australian Jerky! 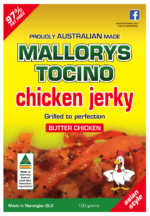 We use 100% Australian Chicken, Australian Pork and Australian Beef, in our jerky recipe, supporting local produce. MALLORY’S TOCINO JERKY originated on the tropical island of Cebu, in the Philippines, from a traditional secret family TOCINO recipe, passed down through the generations. 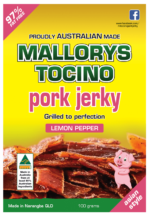 Since then, the family recipe has now expanded offshore and is produced by Malcolm and Lory of MALLORY’S TOCINO in Queenslands’ Sunshine Coast. Many, many years ago TOCINO was a secret family jerky recipe passed only through the generations. The cooking process involved charcoal, and to get that perfect dry texture the tocino jerky was dried on the rooftops in full view of the sun. 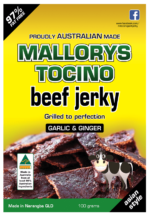 Our ASIAN STYLE JERKY recipe is made with 100% Australian BEEF, CHICKEN & PORK and is handcrafted for quality. BEEF JERKY is traditionally made of thin slices of lean meat, marinated for up to 24 hours, with a mixture of natural herbs and spices, which adds the pleasant bite of the asian savoury flavour. Our beef jerky, chicken jerky and pork jerky is then air dried, grilled and sealed for perfection. 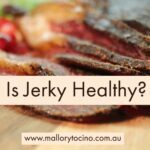 In our opinion, our handcrafted jerky cooking process produces the tastiest Australian Jerky around ! Tasty, moist beef jerky with just the right amount of chewy goodness. It has a long shelf life when stored in an air tight seal and is best kept at room temperature. We don’t use any artificial flavours, in our beef jerky recipe, chicken jerky recipe or pork jerky recipe, so you can be assured of a quality jerky, packed with flavour. Have you tried all our jerky flavours? Visit our shop to select your favourites from our Beef Jerky, Chicken Jerky and Pork Jerky range. The butter chicken jerky is to die for! 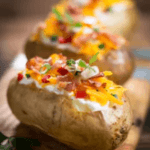 …camping, travelling, or a healthy lunchbox snack. It’s a perfect nibble paired with your favourite beverage. 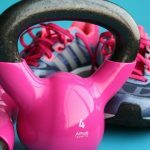 Many of our customers keep a pack or two handy for post gym workouts for a quick protein snack to help muscle recovery. And best of all, being a 97% fat free protein snack, it is a healthy choice. Enjoyed by all ages!